Comedian will guest star on the new ABC comedy as Ken's famous and successful sister. Well, that's kind of perfect. 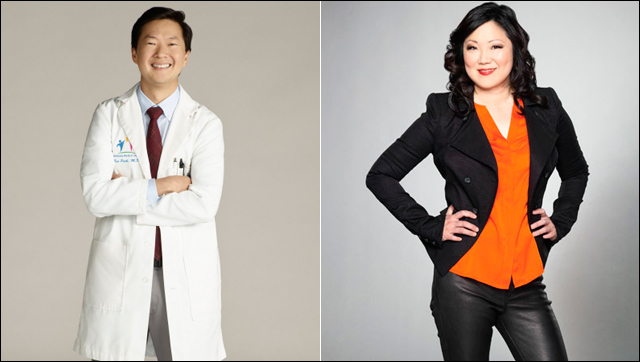 Comedian Margaret Cho will guest star as Ken Jeong's sister on an upcoming episode of the new ABC comedy Dr. Ken. I can't think of anyone more appropriate for the role. Dr. Ken is inspired by Jeong's own experiences as a real-life doctor. He stars as Ken Park, a brilliant but frustrated HMO doctor juggling medicine, marriage and parenting -- succeeding at none of them. In 1994, Cho made history starring in her own short-lived ABC comedy All-American Girl, the first network sitcom centered around an Asian American family. It only lasted a season, and it would take another two decades before we saw another Asian American family hit prime time. But let us recognize a trailblazer. So it's rather fitting that Margaret will playing Ken's awesome, more accomplished sibling. According to Yahoo! TV, Cho will appear on an October episode as Ken's wildly successful sister, Dr. Wendi, described as "a famous TV doctor with a big, energetic personality." It's perfect. Dr. Ken also stars Suzy Nakamura as Allison, Tisha Campbell-Martin as Damona, Dave Foley as Pat, Jonathan Slavin as Clark, Albert Tsai as Dave and Krista Marie Yu as Molly. Dr. Ken premieres October 2 at 8:30PM on ABC.